North American retailer Target is giving away a free Pokemon Sun and Moon poster this weekend! All you need to do is ask for it! On Saturday, November 19th, you’ll be able to pick up the poster as well as a training card for the TCG game as well. Details below from the Pokemon blog post. Pokémon Sun and Pokémon Moon Blast Off at Target! Celebrate the launch of Pokémon Sun and Pokémon Moon with a special event at Target stores. Visit participating Target stores between 11 a.m. and 2 p.m. on November 19, 2016, to celebrate the launch of Pokémon Sun and Pokémon Moon. 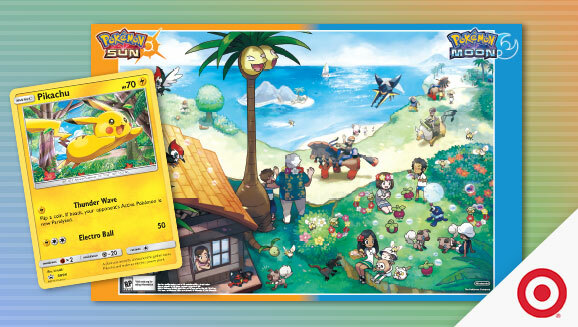 Visitors can pick up a Pokémon TCG promo card featuring Pikachu, as well as a poster of characters from the Alola region. This is also a great time to pick up your copy of Pokémon Sun and Pokémon Moon, as well as check out the new Pokémon TCG: Alola Collection, featuring an awesome collection of cards, figures, pins, and more. While you’re there, be sure to take your picture with the new starter Pokémon of the Alola region. Then share your picture using the hashtag #TeamLitten, #TeamRowlet, or #TeamPopplio to show off your favorite Pokémon. Start your next big Pokémon adventure with a special Pokémon Sun and Pokémon Moon event at Target on November 19!